The APAC region, largely led by China accounted for more than a third of the global propylene oxide market in 2017 and this is poised to rise to more than 35% by the end of the forecast period. 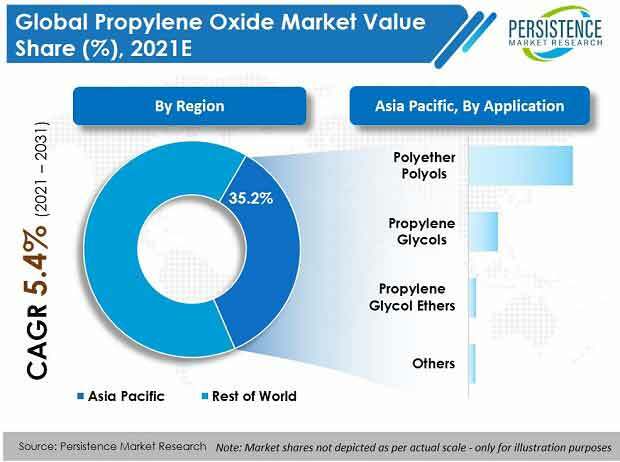 Within APAC, China alone accounted for over 3/4th of the market share in 2015 and is predicted to account for around 77% of the APAC propylene oxide market by the end of 2025. China should gain a massive 130 BPS over the eight year study period. In terms of market value, China is estimated to be worth almost US$ 3.5 Bn by the end of 2017 and this is anticipated to rise to just under US$ 5.6 Bn by 2025. This is largely on account of the highest CAGR of 5.9%. In terms of volume, China is expected to grow to a little over 4000 KT by the end of 2025 from roughly 2600 KT in 2016 due to a substantial CAGR of 5%. For the forecast period 2017-2025, almost 90% of the total propylene oxide produced in the propylene oxide market is predicted to be consumed by end-use applications such as the continued demand seen for products on account of polyether polyols. The manufacture of propylene oxide by the chlorohydrin method as a feedstock agent is preferred by most manufacturers as it has minimal processing cost. However, it has a number of hazardous effects and therefore, new production plants and process upgrades are in place to ensure that manufacturers switch to a more eco-friendly production method. Propylene glycol is widely deployed as a construction chemical for use in paints, grouts, adhesives, waterproofing materials, and coatings, in both infrastructure and the construction industry. A wide-ranging number of propylene glycol applications are anticipated to be an important driver of the propylene oxide market in the days ahead. Another industry that is witnessing a resurgence in recent times is the automotive industry. This should directly benefit the propylene oxide market as the products are utilized in a number of components such as flexible foams, paints, adhesives, and sealants. Thus, it can be said that the propylene oxide market is intrinsically linked to the automotive industry. Insulators, mattresses, carpets, and car seats are just some products that have continuous consumption and their demand will never ebb due to rapid urbanization and ever-increasing automobile production. The above products are mostly made of polyurethane, the production technique of which needs propylene oxide to be used as a raw material. Therefore, growing polyurethane applications are predicted to directly benefit the propylene oxide market. Propylene oxide derivatives also find use in several end-use products such as automotive coolants, brakes and hydraulic fluids, and engineering plastics and fibers. In addition to these, propylene oxide can be quite beneficial in areas as diverse as fumigants, flame retardants, modified starch, and textile surfactants. All of these are forecast to drive the continued growth of the propylene oxide market for some time to come. Propylene oxide is deployed as a raw material to manufacture polyester and many other chemicals that are then used to manufacture paints, solvents, grouts, and insulators. However, alternatives to propylene oxide have begun to emerge in recent times and these could potentially restrain the unencumbered growth of the propylene oxide market. For e.g. - The Huntsman Corporation markets Alkylene Carbonate as a viable substitute to propylene oxide that is already used to manufacture many products that comprise solvents, grouts, paints, and insulators.